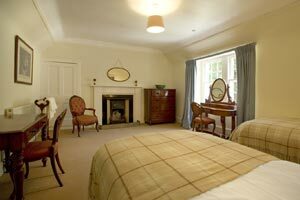 Recently renovated 18th Century Sporting and Holiday Lodge. At the head of Loch Duich overlooking River Shiel. 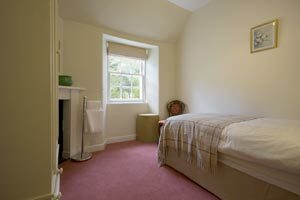 Self-catering rental accommodation sleeping up to 12 in 8 bedrooms. 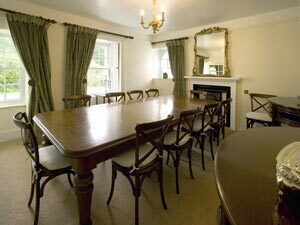 A traditional Scottish Highland Lodge for parties of friends or family of up to 12. Set in thousands of acres of mountainous wilderness. Above; Loch Duich and Shiel Lodge. Right; Shiel Lodge from the drive. Where the road to Skye passes between the peaks of the Five Sisters of Kintail and the Forest of Glenshiel the landscape opens out at the head of Loch Duich. A small side road goes over the old Shiel Bridge, and a little further on is the rhododendron-lined drive to Shiel Lodge. Originally dating from the 1700's this is a genuine traditional Highland sporting lodge for an estate of many thousands of acres of heather covered hills (including Munros - over 3000ft), woodland, waterfalls and remote glens. Parties of guests of up to twelve rent the lodge on a self-catering basis, and have unrestricted access to the estate - it would be a day's outing to walk to the marches and back (march, Scots for boundary). 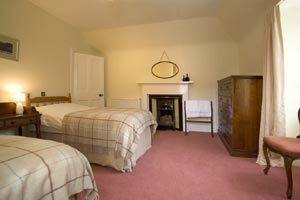 Sympathetically and thoughtfully restored and refurbished, there is a comfortable arrangement of the various bedrooms and bathrooms, two sitting rooms - one with a big open log fire, a properly equipped kitchen with the breakfast room just off as well as a formal dining room. The hall has a large scale map, and there is plenty of space for provisions and outdoor gear - and a drying room. 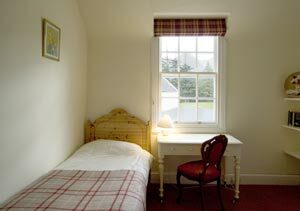 In all four seasons Shiel Lodge is perfect for gatherings of friends and family, with access Skye and Torridon, sailing, fishing and some of the very best hillwalking in the West Highlands of Scotland from the moment you step out of the door. 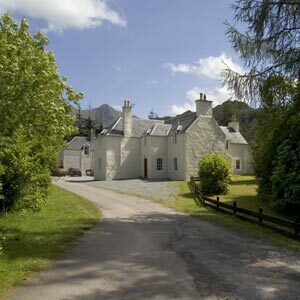 The property is a traditional highland shooting/holiday Lodge. 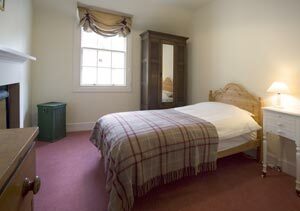 The accommodation is spacious, arranged over two floors and comfortably furnished. Drying Room, Laundry (with washing machine and tumble dryer), 2 shower rooms each with WC. The bathrooms have original old-fashioned cast-iron roll-top baths. The beds all have modern good quality mattresses. and the Breakfast Room (not illustrated) leading off it. 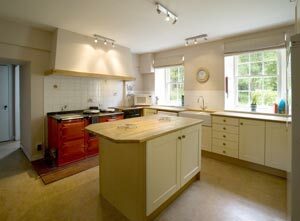 plus a Drying room, Laundry (with washing machine and tumble drier) and Pantry. 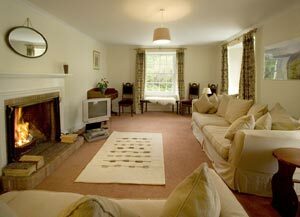 The Lodge is let by the week, normally from Saturday to Saturday except for the Christmas and New Year weeks. 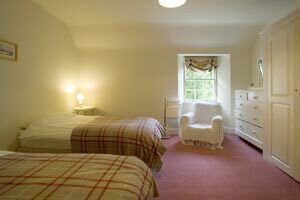 Prices include electricity and central heating, linen and towels. No smoking. Pets only by special prior arrangement. You can enquire about prices using the contact below. 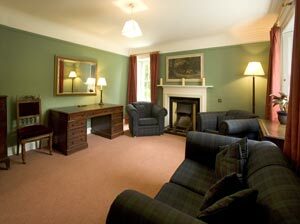 This page: Accommodation at Shiel Lodge. Please tell Shanea you found Shiel Lodge through About Scotland! 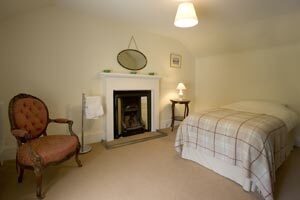 Reservations for accommodation are accepted by Strutt & Parker on behalf of the owners of Shiel Lodge.